Hair from animals such as horses, goats and cows, has been used as a binder for internal plasterwork for centuries. We find this in many of the buildings we work in. There is a small chance that animal hair used in historic plaster may contain anthrax spores, and so it is important to consider the health and saftey implications of working on ceilings and plasterwork such as this. 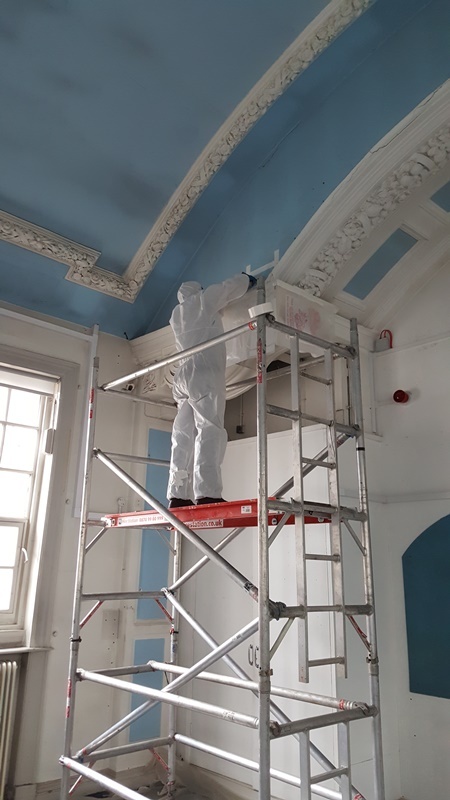 While the risk of contamination from contact with historic plaster is very small, when repair and restoration works are planned, it can be useful to undertake testing to ascertain whether anthrax spores are present, to determine the best approach to undertaking the works. We were asked to take samples for testing, from the ceiling and walls in this late 19th century building. It was important to carefully consider the best place to remove samples of plaster, to cause as little damage to the historic fabric as possible. With this in mine, we opted to take the samples from three areas which had already suffered damage and were due to be restored. We felt this struck the best possible balance between preserving original fabric, and obtaining the samples for necessary testing.